January 9, 2018 — The winner of our Dream Project contest is Teachers in Space, Inc. We will be funding classroom experiments that will fly aboard the Perlan II stratospheric glider which just set the world altitude record. 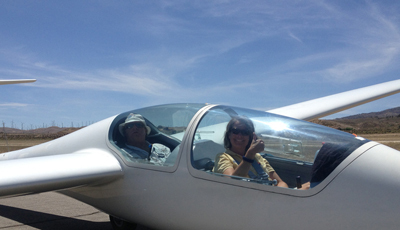 The glider is currently in Minden, Nevada which happens to also be the location of our headquarters! More information about these experiments will be available soon. Learn more about our Dream Project contest! Teachers in Space, Inc. is a nonprofit educational organization which stimulates student interest in science, technology, engineering, and mathematics (STEM) by providing their teachers with extraordinary space science experiences and industry connections. Their professional development workshops for STEM teachers include personal and experimental flight opportunities, hands-on work with data sensors and remote device control, opportunities to meet and interact with scientists and developers at NASA and commercial space companies, and unique teaching materials and design contests to take back to the classroom. Teachers In Space, Inc. sparks a transfer of passion for space science and exploration from teachers to their students, preparing and encouraging those students to pursue further education and exciting, rewarding careers in the emerging space industry.